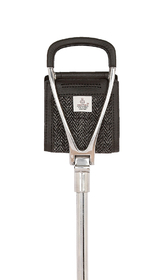 Black leather and grey Harris tweed adjustable shooting seat stick with aluminium shaft and cast metal spike ferrule and ground plate. A popular choice for all outdoor sporting events. Lower length height adjustable from 29.5" to 36" or 78cm to 87cm.